Due to the loss with General Braddock's expedition in July 0f 1755, a series of forts were to be erected as a shield for the colony of Pennsylvania. 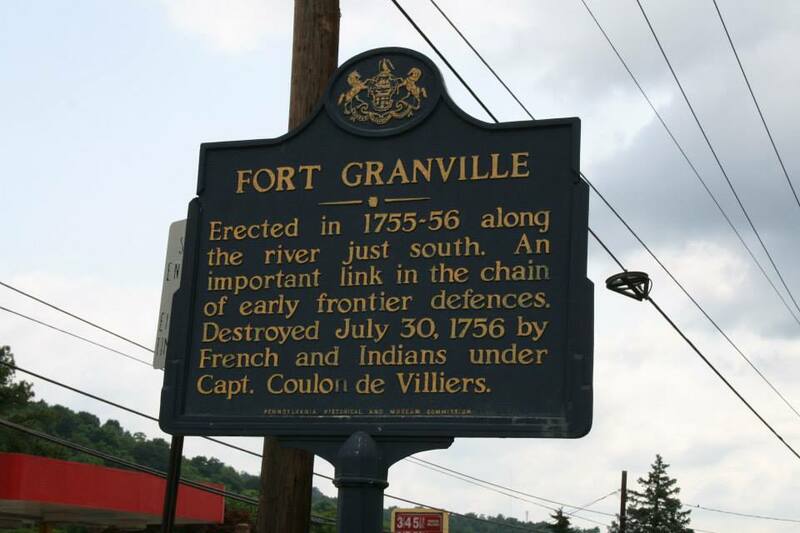 One of these forts was to become what is known as Fort Granville near present day Lewistown. "Sir:—You are desired to proceed to Cumberland County and fix on proper places for erecting three stockades, viz. : One back of Patterson's, one upon Kishecoquillas, and one near Sideling Hill; each of them fifty feet square, with Block House on two of the corners, and a Barracks within, capable of lodging fifty men. You are also desired to agree with some proper Person or Persons to oversee the workmen at each Place, who shall be allowed such Wages as you shall agree to give, not exceeding one Dollar per day; and the workmen shall be allowed at the rate of six Dollars per month and their Provisions, till the work is finished." Instead of making the fort at Kishecoquillas creek, he chose a spot about a mile away. On the banks of the Junina next to a small spring is where he built the fort in 1755. By 1756 the inhabitants were only leaving the stockade for brief tasks due to the sightings of numerous Indian war parties and raiders throughout the area. Some of the troops were sent to Tuscarora to assist the settlers there. On July 30th the fort commander marched out to assist the residents of Sherman's Valley to protect them during their harvest. He left behind a LT Armstrong and 24 men to man the fort. The scouts for the raiders ascertained the weakened condition of the fort and gathered the raiders together. Over 100 raiders and 55 French troops descended upon the fort and laid siege to the fort on August 2nd. The fighting was fierce, but the defenders managed to hold off till morning. By Midnight that night, the French managed to set fire to part of the fort. Lt Armstrong was shot while attempting to extinguish the flames. The French commander offered under flag of truce for Quarter to the defenders if they would surrender. Armstrong declined and the battle raged on. Several time throughout the night offers for quarter were given and each time Armstrong refused to surrender. during the course of the battle Armstrong was shot a second time and finally lead no more. Shortly after the passing of Armstrong, the next person in command, Sergeant John Turner surrendered the fort. However fate was not kind to the good Sergeant. The Indian allies of the French decided to make an example out of John. They tied him to a stake and "after having heated several old gun barrels red-hot, they danced around him, and every minute or two, seared and burned his flesh... After tormenting him almost to death, they scalped him, and then held up a lad, who ended his sufferings by laying open his skull with a hatchet" After they finished this macabre sport, the French burnt the fort to the ground and the luckless civilians were marched off into captivity. Some of those civilians, eleven in number were rescued later of when Lt Armstrong's brother John lead a reprisal raid and destroyed the Indian village of Kittanning in September of 1756. Many other white settlers were evacuated by the Indian prior to the attack and were not brought back from Ohio to until 1764. The exact location of the fort is in debate among modern day residents. In 1829 the prime suspected location was dug up by the Pennsylvania Canal with no thought to the historical significance of the location. They also apparently dug up the spring as well. The fort was reported to be built on the land of one James Turner, about 1 and 1/2 miles south west of Lewistown on the north bank of the river. There is a small to scale model of the fort done in the 1950's (?) of the fort at the McCoy house in downtown Lewistown.